At the end of Part One, we finished with the images of the TNG cast shown in the 2018 trailer and listed what guidelines “Temporal Anomaly” broke, along with what we thought may have been the reason for CBS to halt this production. In this part we hope to expand on those summaries, and what might be some other possible reasons as to what might have caused CBS to contact this film and asked them to halt. Now, we can already hear people crying out that CBS is wicked, CBS is the devil, how dare they stop this fan film, well the truth is, unlike the Star Trek copyright which is owned by CBS, an actor’s likeness is something that they do not own. Consequently, we start this part explain why the use of the TNG would be so problematic not only for this fan film but for CBS as well. Did Contractual Agreements With The Actors Cause CBS To Act? 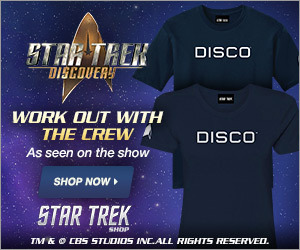 Contractual agreements are complex, long and extremely binding as to what is allowed and what is not, with that said, what CBS had here was not only a fan using their IP in both the use of the snippets of film and voices taken from official Star Trek, but also the use of the Trek IP to construct the fan film. For CBS to do nothing and allow this fan film to proceed could have caused a potential breach of contractual agreement with the actors in question, after reading many example contracts we have found online, not one of them allows for third party use and even though a fan film is in no way officially sanctioned by CBS even with the guidelines, for CBS to do nothing, it could have caused the actors to start asking questions as to what the studio is doing to protect their likeness from being used in this manner, as it is highly unlikely that these actors signed to allow third party use of the footage they shot to be used for anything but what they were paid for. Could “Temporal Anomaly” have gained the authorisation needed to use not only one but a total of SIX Hollywood actors in their fan film? Short answer is no, not only would mean obtaining the rights from CBS for the images, footage and voice over’s used, which is likely to never be allowed, as on many occasion CBS has hinted that they would never license a fan film, but it would also would require written authorisation from all involved that is SIX Hollywood actors, and a license from CBS to use the footage. Since their Kickstarter has been sat just shy of £2000 for almost 5 years, even with a miracle this is something that again is extremely unlikely due to issues with the funds required. Ok so obtaining the rights to the footage and the written authorisation from the actors would be extremely difficult why would using these actors in your fan film be such an issue, I mean it is only a fan film? In almost all cases, especially for A-list actors like Sir Patrick Stewart the use of their likeness is protected by law, and essentially a well-known brand, for anyone to use an actor’s likeness or voice without explicit authority opens you up to not only a lawsuit for Unlawful Use of Name or Likeness but also a Breach of Privacy by the actors themselves. 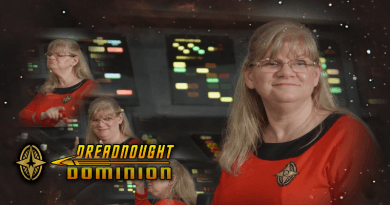 So the cast and crew of Temporal Anomaly have extremely lucky that CBS stepped in when they did and didn’t ignore this fan film, as this could have been so much worse for all involved if this had just been released, and instead of a kind word or two by CBS this might have drawn the attention of people with less patience than CBS has shown fan films for over a decade. So there we have it, we have our own theories as to why this is not a simple issue to fix, but we do not make fan films, and as such we decided to ask some of the people who actually do or have made fan films to see if we were thinking along the correct lines. Randy Landers, Potemkin Pictures – “They broke at least three of the guidelines (don’t call it Star Trek, don’t make it be more than 15 mins — or 30 if it’s a two-part episode). But the biggest thing they did wrong was to use footage from TNG featuring Sir Patrick Steward, Jonathan Frakes and Marina Sirtis. John T. Atkin, Yorktown – “The issue at hand here is fairly obvious. The trailer for this fan film used actors from ‘Star Trek: The Next Generation’, without the consent of the studio or the actors from the film series. Kasey Shafsky – “Speaking for myself, I think that CBS is being properly diligent with their property. Samuel could make some easy and meaningful alterations and fit into the guidelines. Lose all clips with TNG actors. Maybe he could hire a sound-a-like if the story absolutely demands certain characters. Or he can rewrite the story so it can hold up without those characters. Stay in the “around 20 minutes” in runtime as written in his Kickstarter info, i.e. two 15 minute parts. Alter the title of the short film to adhere to CBS’s guidelines. Be respectful and realize who’s playground you are playing in. Is Samuel obstinate in that he won’t change his course of action? I don’t know. I think Samuel is a smart guy who saw how things turned out for another guy who many says was stubborn, unyielding, combative and recalcitrant. I wish Samuel the best in his endeavours and how he interacts with CBS. 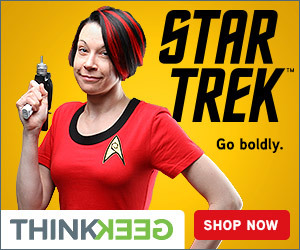 “A Producer, From Well-Known Fan Series” –“Once you put the images and the voices of the TNG cast members without their permission, you were asking for trouble. Ray Tesi – Republic, Stage 9 Studios –“I’ve known Sam a long time now, having had him work his magic on the past and current versions of Starship Republic. I have also had my own experiences with CBS in regards to both Republic and Stage 9 Studios, and they were all positive. Is there a fix for this to allow the film to continue? So currently there is no information as to what Samuels’s end game here is and if the fan film will move forward just scaled back. However, if CBS allow Samuel to continue with all elements left in, which is highly doubtful as mentioned above they have very limited rights to decide what can and cannot be done with them, this might not be the end of the issue and this may lead to further issues down the line. As with ALL fan productions, we hope both CBS and Sam are able to agree upon what needs to change and for Sam to remove the objectionable elements so this fan film can be released and satisfy the many fans who want to see it, and more importantly, avoid any legal issues that could arise. ← Truth or Myth – Captain Kathryn Janeway: Hero OR Criminal?